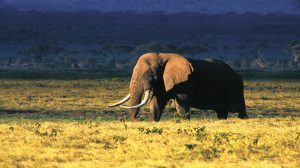 A three hour drive south from Nairobi on a tarred road, gets you to the turn off to Amboseli National Park. Passing through several villages along the way we encountered an interesting array of transport: matatus, the local buses, tuk tuks which are 3 wheeled enclosed motorcycles and capable of fitting as many as 6 very squashed passengers as well as their assortment of shopping, and boda bodas: motorcycles which serve as taxis, once again carrying several passengers and their shopping. Donkey carts were numerous and bicycles loaded with large water bottles for delivery were also abundant. The last hour of the journey was over dirt road, where we experienced the “African massage” – bouncing and bumping along the road. By the time we reached our lodge, we were very “massaged” indeed. Amboseli lies in the southern part of Kenya and just across the border is the magnificent Kilimanjaro, Africa’s tallest mountain. On a clear day you are able to see the mountain in her glory and if you are very fortunate, perhaps a herd of elephant for which this park is famous, may pass between you and the mountain for one of those iconic photos! 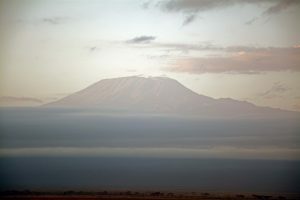 No such luck for us, but we were fortunate to see the mountain peak at sunrise on our final morning in Amboseli before the clouds descended and covered her from sight. Our lodge was fairly centrally located in the park, and right next to a large wetland area. 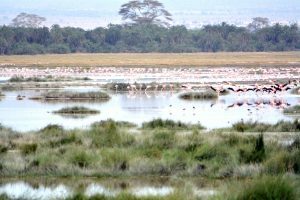 Due to high water levels further north, we were graced with the sight of large flocks of flamingoes that had flown south, wading along the edges of the water in search of the algae they consume – they are so graceful and elegant. Every time I go out game viewing I try to remember that I am so fortunate to be able to do this, and try to appreciate every sighting of game. 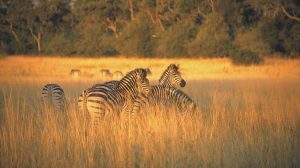 It is easy to get complacent about the plains game: zebras, wildebeest, impala and other small antelope which are the most abundant and most regularly sighted animals in the hope of sighting the more elusive animals. They are all so amazing, and can on occasion be quite entertaining as well. 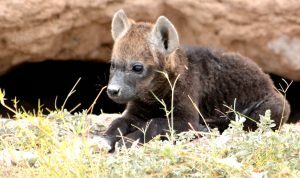 We were fortunate to also come across plenty of elephants, a few different prides of lions, a hyena den where we spotted two pups playing in the sun before disappearing into the den to rest. We had our first sighting of one of the three different giraffe species found in Kenya: the maasai giraffe, with its distinctive white “socks” on the lower leg, buffalo, warthogs, olive baboons, hippos and vervet monkeys. Birds are such a large part of the game experience and we were fortunate to spot over 50 species. We spotted a large flock of vultures hanging around waiting to get their share of a lion kill, it was a bit like watching a bunch of noisy, squabbling children and very entertaining. My favourite was a tiny woodlands kingfisher, which had just caught a frog. The little bird struggled for ages to swallow the frog, all we could see were the legs sticking out, but eventually succeeded. On our final morning as we were heading to the gate for our next destination, we spotted a Vereux owl sitting in a tree right next to the road. 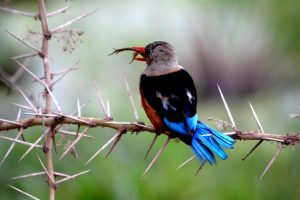 What a fabulous ending to our stay in Amboseli spotting one of my favourite birds.